Sport is a powerful thing. It has the ability to produce great joy and heart-breaking sadness for fans and observers. It requires of the players themselves dedication, discipline, passion, and a tireless commitment to improvement. Sport transcends borders, national identities, religions, and economic conditions. It is this ability to transcend that brought Ascend Together and the US Peace Corps together to host the first-ever Hoops and Dreams Basketball and Youth Development Camp at Independence Stadium. Basketball is growing in popularity in The Gambia and Ascend Together has been on the fore-front of creating opportunities for youth basketball in schools. Through our RISE Gambia program, we provide student-athletes with basketball training, equipment, and structure, while also offering after-school tutoring and life-skills curriculum. Working predominantly with youth, we’ve pivoted our curriculum to address one of the most pressing issues facing young people in Gambia today: backway migration. The Gambia has the highest rate of migration of any country in Africa, losing 12,000 young people each year (0.5% of the national population) to migration to Europe. People take the backway because they want to help support their families financially and see Europe has having more opportunities to do so than Gambia. But the route is incredibly dangerous; migrants are routinely kidnapped, tortured, and held for ransom in Libya before making the risky boat crossing to Italy where overcrowded boats often capsize. Once in Europe, migrants spend at least one year in “camps” while they await a decision on their asylum request. Because Gambia is a peaceful country without conflict, the rate of denial for Gambian asylum requests is high: 67% in 2016. That means that even when they reach Europe, only one out of three Gambians will receive documents allowing them to work legally. But for those who do, the rewards are worth the trip. Walking through any provincial village, it’s obvious which families have relatives in Europe; their houses are made of cement instead of mud and they often sport solar panels, TVs, and refrigerators. What’s not seen is the reduced burden of having to guess where the next bag of rice will come from or how to pay back loans taken out from local shops to cover the costs of food while a family waits for the harvest to bear fruit. Remittances sent home from Gambians abroad accounted for 22% of The Gambia’s economy in 2016 according to a report released by the International Fund for Agricultural Development (IFAD). These remittances have helped relieve the burden of poverty for many Gambian families. But the loss of so many young people to migration has detrimental effects on the local economy, family structures, and the work force. It may also be unsustainable, particularly as Europe grapples with how to provide employment for an influx of migrants from all over the globe. But in a country with 29% unemployment (data from 2014), where the average woman has more than five children, what options do young people have? That’s where the Hoops and Dreams Camp comes in. We invited 86 of the top young male and female basketball players in The Gambia, from urban neighborhoods in Bakau, Serrekunda, and Lamin, all the way up to the provincial town of Bansang, to the three-day camp. In the mornings and evenings the campers honed their skills in basketball activities, which featured individual and team drills, a 27-game tournament, all-star games, and performance awards. But in the heat of the afternoon the venue would shift to the conference hall where campers were treated to a catered lunch and a host of guest speakers with a single message: let’s build the new Gambia right here, in Gambia. One of the first to speak was Mustapha Sallah, a former migrant recently returned from Libya who is part of an organization of returned migrants called Youth Against Irregular Migration, which aims to educate young people about the dangers of the backway through their own stories. More comfortable speaking in Wolof, Mustapha walked the young campers through his experience in Libyan detention centers where he witnessed Gambian migrants die before they ever even saw the Mediterranean. Mustapha returned to Gambia voluntarily as part of a repatriation program sponsored by the International Organization for Migration. It can be hard to return, he says, because the money invested by the extended family to sponsor the trip was wasted. But when he arrived in Gambia his family embraced him with tears of joy. Mustapha’s organization is now trying to provide support for the growing number of returned migrants. Ms. Njie, whose Tiga Swimwear produces swim suits and other clothes using African fabrics and accesses overseas markets through online sales, elaborated that there are a host of economic possibilities in Gambia, and it’s all about finding new market ideas. 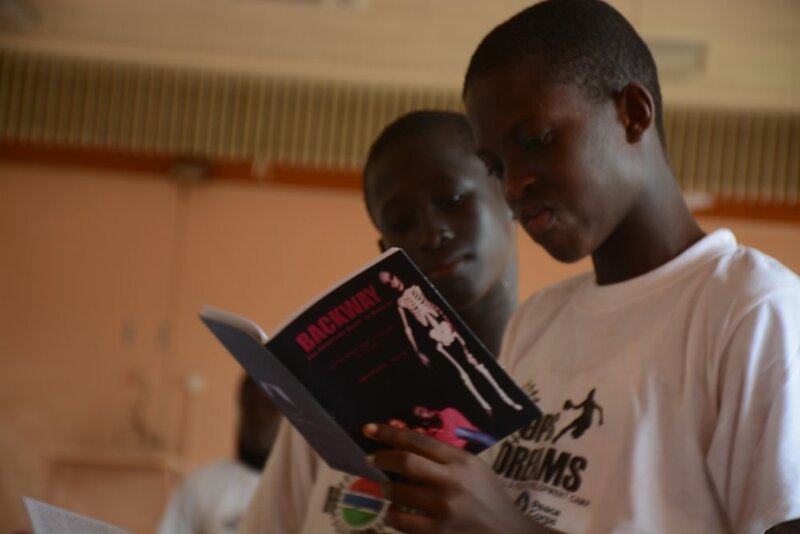 Other presenters at the camp included the Ebunjan Theater Company which recently released a play titled “Backway”, The Youth Empowerment Project, the Gambia Start-up Incubator, and the Medical Research Council. All of these organizations are stakeholders in the future of Gambia and Gambia’s youth. The young campers recorded the presentations on their phones, sharing them with friends and family, and of course there were plenty of selfies and group photos. The energy that sport brings to daily life also lends strength to the message of the camp. At the closing ceremony, attended by parents and extended family, a group of campers asked if they could perform an impromptu skit. All of their own accord, the six young Gambians regaled the crowd with a story played out all too often in real life: three young migrants leave Gambia in search of a better life. One is killed in Libya and the others reach Europe but find it a harder place than they expected. At the close of the skit, 15-year old Bintu Dambally, microphone in hand, tells the crowd “We have everything we need right here; the people, the culture, the resources, to make Gambia a great country without taking the backway.” Her peers cheered the performance, taking video with their phones and sharing the message.